It’s also true, however, that if we understand the gospel the way we should, our giving – at least for most – will increase. Why? Because we’ll see Jesus and the salvation he brings, as the singularly most important, infinitely valuable, everyone-must-hear, news that exists. 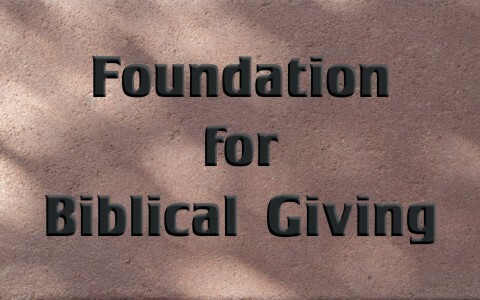 Biblical giving is primarily a question of alignment. The alignment of my heart with God’s heart. Speaking to the religious leaders of his day, Jesus said, “This people honors me with their lips, but their heart is far from me.” It’s a heart change that leads to correct giving. In this short parable Jesus created a contrast between the value of God’s kingdom and the value of everything else. Not only does this man sell everything to possess the field and its treasure, he does it with joy. He longs to have what is most valuable. Being captured by the grace of God through the cross-work of Jesus opens our eyes to the infinite value of the gospel and the lesser value of anything that would compete for our priorities. It is impossible to give as we should if our money – or the things that money can buy – are as valuable to us as the gospel. All that Jesus is for us should dominate our focus and serve as the controlling influence in our lives. We will know that the gospel is our treasure as it defeats the idols in life. Idols like money. It’s tempting to think that the Christian life is a better and “cleaner” version of what the world offers. But that’s not true. Believers don’t live in an improved paradigm. We live in a new reality where Jesus is King, sin has been defeated, and life takes on an eternal scope. And just like Jesus, we are here to live fully for the glory of God. The way we raise our children, do our work, spend our leisure time, relate to coworkers, spouse and other believers and our enemies, should be done with the mission in mind. The mission to bring God glory. We are new people with a new reality that does not conform to this world. We’re here as disciples. We’re here to follow Jesus in his mission. So, we not only possess a treasure of infinite value, our lives are now meant to show the world how valuable our treasure really is. When we embrace Jesus as we should and live for the mission, giving becomes natural. And what did his giving accomplish? Our salvation, glory to God, and great joy for him. In following Jesus, we must know that it means giving. Giving is how we follow Jesus. This one is tough because living as a giving servant is difficult. Another way of looking at this is through the concept of stewardship. Since we live in the hands of the sovereign, creator, sustainer God, we know that all we are and have comes from God and belongs to God. We are stewards of his gifts for his glory. We will only give as we should if we believe that God will, as he promised, take care of us. If we don’t live in the light of God’s promises, we will hoard for ourselves and not give. If, on the other hand, we are content in God’s care and provision, we will give. Giving demonstrates that we trust in God and not in earthly riches. We cannot give the way we should if we are not walking by faith. Giving shows that God is our hope and satisfaction. Giving proves that we trust in God and not in earthly riches. So, what is the result of living a gospel-first, missional, I-want-to-be-like-Jesus, walk-by-faith life? We give. Next post: What Does Judgment Starts At The House Of God Mean?